Roughly half of pregnancies among adolescents aged 15–19 in Sub-Saharan Africa are unintended,1 and about half of these end in abortion.2–5 Nearly four-fifths of these abortions are unsafe. Among the 53 million women aged 15–19 in Sub-Saharan Africa, 23% (12.1 million) need contraception because they are married, or are unmarried and sexually active, and do not want a child for at least two years. Of these 12.1 million adolescents, 38% (4.6 million) are using modern contraceptives. The most common method is the male condom (accounting for about four in 10 users), followed by injectables and the pill. The other 62% (7.5 million) are not using a modern method; these adolescent women have an unmet need for modern contraception. Among these women, 87% are using no method at all, and the remainder use traditional methods, which are less effective than modern methods. Unmet need is higher among married adolescents aged 15–19 than among sexually active unmarried adolescents (68% versus 59%). 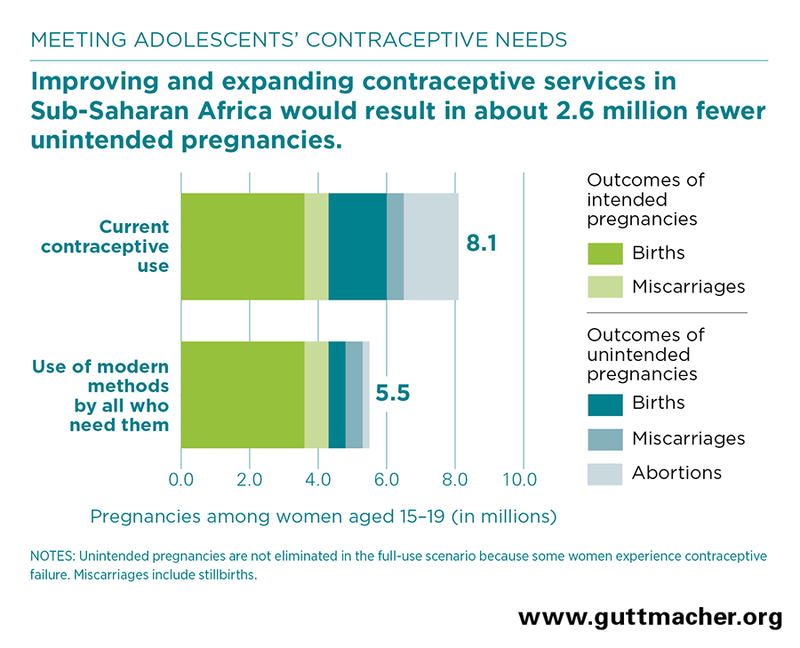 Among Sub-Saharan Africa’s subregions, unmet need is highest in Middle Africa, where 73% of sexually active adolescents who want to avoid pregnancy are not using modern contraceptives. In Southern Africa, this proportion is 32%. Based on 2017 estimates, the annual cost of providing contraceptive services to 4.6 million women aged 15–19 who use modern contraceptives in Sub-Saharan Africa is $58 million. This averages to $13 per user annually. Service costs include direct costs for contraceptives, related supplies and health worker salaries, as well as the indirect costs of management functions, construction and maintenance of facilities, information and education activities, and other types of program support. If services were improved for the 4.6 million adolescent women currently using modern contraceptives, costs would increase from $58 million to $183 million. Examples of improvements that would benefit adolescents include better contraceptive counseling and follow-up, consistent availability of a range of modern methods and providers who are trained to work with adolescents. If the 7.5 million adolescent women with unmet need were to use the same mix of modern methods as current users and receive improved services, total costs for current and new users would be $426 million annually. The expanded and improved contraceptive services for all 12.1 million women who need them would cost $35 per user annually. Put differently, the annual cost per capita in Sub-Saharan Africa would be 42 cents. Much of the increase in cost is for upgrading the health systems that support contraceptive services. If all adolescent women who need modern contraceptives were to use them, unintended pregnancies would decrease by 2.6 million per year (69%), and total pregnancies would decrease from 8.1 million to 5.5 million per year. This would result in 1.2 million fewer unplanned births; 1.1 million fewer abortions, nearly four-fifths of which would have been unsafe; and 338,000 fewer miscarriages and stillbirths from unintended pregnancies. Maternal deaths—those due to complications of pregnancy and childbearing—among women aged 15–19 would drop from the current level of 18,600 per year7 to 14,500. 4. Sully E et al., Playing it safe: legal and clandestine abortion among adolescents in Ethiopia, Journal of Adolescent Health, 2018, https://www.jahonline.org/article/S1054-139X(18)30010-7/fulltext. 5. Sully E et al., Estimating abortion incidence among adolescents and differences in postabortion care by age: a cross-sectional study of postabortion care patients in Uganda, Contraception, 2018, https://doi.org/10.1016/j.contraception.2018.07.135. 6. Sedgh G, Ashford LS and Hussain R, Unmet Need for Contraception in Developing Countries: Examining Women’s Reasons for Not Using a Method, New York: Guttmacher Institute, 2016, https://www.guttmacher.org/sites/default/files/report_pdf/unmet-need-for-contraception-in-developing-countries-report.pdf. 7. Institute for Health Metrics and Evaluation, Global Health Data Exchange: GBD results tools, Percent of total deaths from maternal disorders to females aged 15–19, 2016, and distribution of 2016 deaths from maternal disorders by cause of death, 15–19-year-old females, by country, 2016, http://ghdx.healthdata.org/gbd-results-tool.